This is an amazing sought after all original rare vintage 1940s Bakelite brooch. 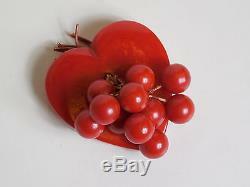 A wonderful large red heart with 11 small Cherries. 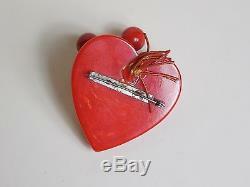 The large heart is a beautiful "End of Day" red Bakelite and the cherries are suspended with red plastic covered cord. A lot of the cord has lost the plastic paint but the cord is still good durable condition. The heart and cherries are in excellent condition with no cracks, chips or repairs. The pin back is all original and in perfect working order. Approx 2.25" long x 2.25" wide. The item "1930 1940 Large Vintage Bakelite Red Heart with Cherries Cherry Pin Brooch Rare" is in sale since Monday, November 21, 2016. This item is in the category "Jewelry & Watches\Vintage & Antique Jewelry\Costume\Bakelite, Vintage Plastics\Pins, Brooches". The seller is "shimmeringscarab" and is located in Pomona, California. This item can be shipped worldwide.